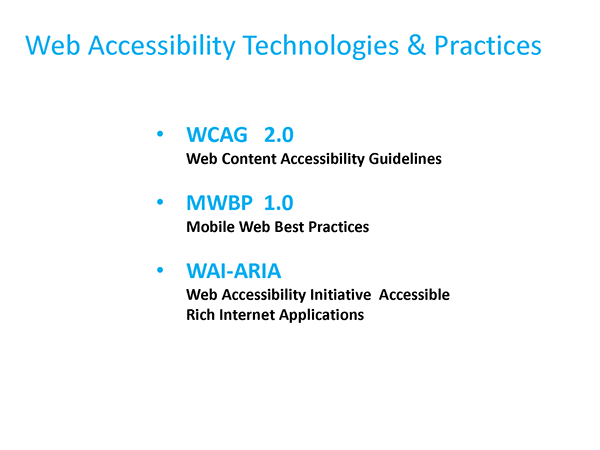 Rediscovering Accessibility for Future Tech! 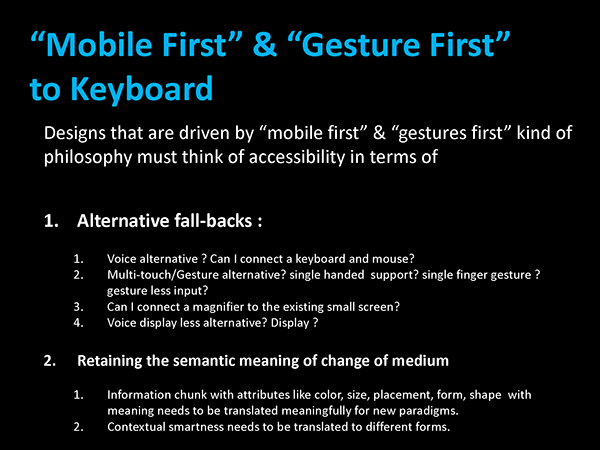 This is a rediscovery of “Accessibility” in the world of touch-screens and other natural interfaces. 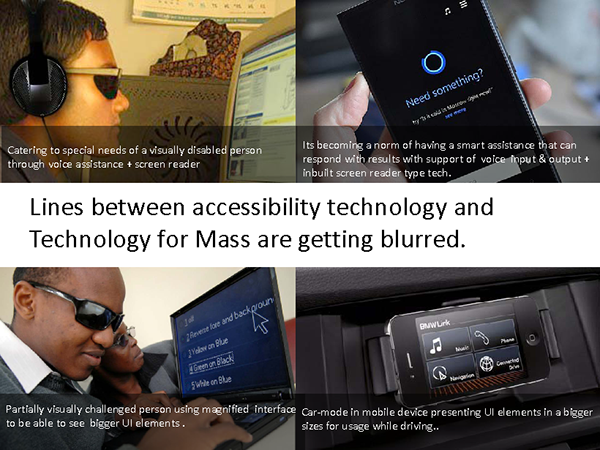 With new technology innovation the lines between accessibility technology and Technology for Mass are getting blurred. 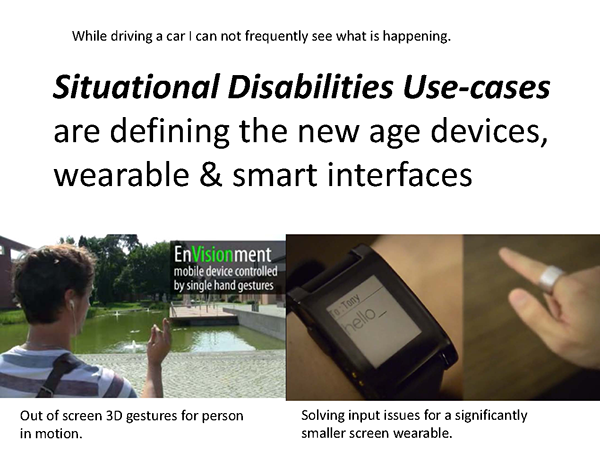 What used to be a special need is becoming a general need for mass use.Situational Disabilities Use-cases are defining the new age devices, wearable & smart interfaces. 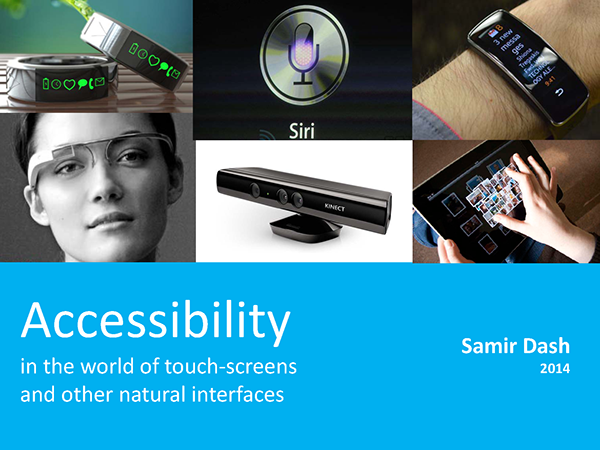 High time we need to rediscover on “accessibility” what we think we have already discovered! Lean UX : Another Agile UX? The objectives of the project stays same from kickoff to the point where the finished product is launched. The designers created the set of design specifications as a contract which the developers had to implement into the final product. 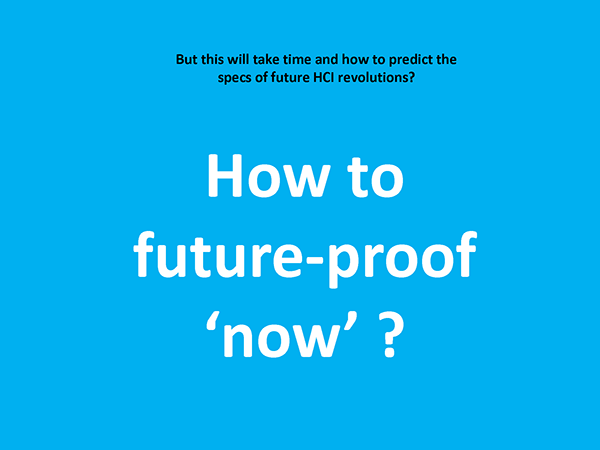 And above two cannot be expected from Agile model as it is based on iterations and gradual exploration of what is best fit for the final product . On ejust simply cannot predict the final design from the start of the project. So many attempts were made to get the best agile SDLC practices that can incorporate the UX , before “Lean UX” was born. As the above figure shows the documentation and guidelines are stripped to their bare minimum components, providing the minimum amount of information necessary to get started on implementation. Also Long detailed design cycles are discarded in favor of very short, iterative, low-fidelity cycles, with feedback coming from all members of the implementation team early and often. Different approaches. 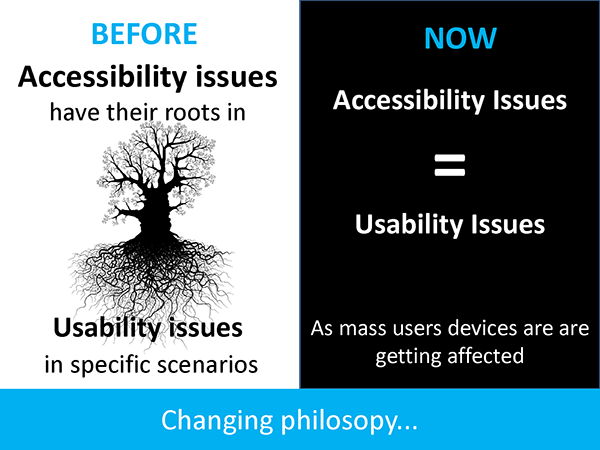 Usability methodologies are centered on the user and holistic view of the user needs whereas agile methodologies take a broader view and focus on the stakeholder. Agile methods primarily focus on delivering working software early. Different goals: Software engineers focus on the technical design, implementation the system where as UX practitioners focus on “developing systems so end-users can use them effectively”. Organizational challenges: The agile methodologies focus on strategy where teams are self-organizing whereas UX focuses on a centralized UX groups within some organizations so that the needed practices, tools, and standards can be provided. 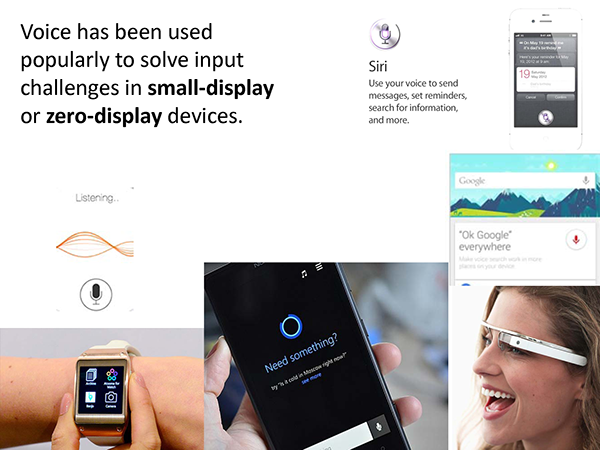 UX practitioners struggle to be heard: Many UX practitioners often complain that the results of their work are not considered in the design decisions and even if it is heard, there seems to be focus more on engineering decisions over the usability decisions. Many of UX practitioners see “Lean UX” as the answers to the challenge we see in implementing UX into an Agile SDLC where it uses “taking the best parts of our current UX practices and redesigning them specifically for use in an agile world”. Lean UX, is about reducing waste in a process by removing it from the value chain of the usability process.. The proactive measures for border engagement in Agile model has paved path to a new and more practical implementation of UX discipline and methods called “Lean UX” Lean UX once blended with any exiting Agile SDLC, helps to “create a more productive team and a more collaborative process” . Design Thinking:This foundation upholds the concept that “every aspect of a business can be approached with design methods” and gives “designers permission and precedent to work beyond their typical boundaries”. Agile Software Development: Core values of Agile are the key to Lean UX. “Lean UX” is seen as the answers to the challenge we see in implementing UX into an Agile SDLC. As discussed in the earlier chapters, Lean UX principles use “taking the best parts of our current UX practices and redesigning them specifically for use in an agile world”. Lean UX solved many issues were even there with the practices and usability process used in waterfall and different derivative iterative models. In Lean UX practices, there is no more requirements for the “objectives will stay the same and that you can design for a single solution throughout the project”. Also there no more need for the designers to create bulky guidelines and documentations for the developers to be used as a contract. Rather the Lean UX practice upholding agile approach, only focuses on each independent design iteration as a “hypothesis” which has to be validated from a “customer perspective” and from a “business perspective” . The beauty here is because of the Agile process being followed, fast iterations can happen to quickly test hypotheses and get to a great design in the end of the project. And this makes case for “collaboration with the entire team” as it becomes critical to the success of the product and the whole project. No practice used in Lean UX is something new. Rather it is “built from well-understood UX practices”. Many of the techniques used over the time in various UX process and have the practical usability even today, have been packaged properly in Lean UX. Lean UX is a totally different term than Agile UX.Lean UX details methods and their practical application in dynamic environment of a Lean StartupIt is the converging point for product development and business, through constant measurement and so called “learning loops” (build – measure – learn). Agile UX defines update of Agile Software Methodology with UX Design methods. It aims to unify developers and designers in the Agile process of product development. However Lean UX uses Agile UX methodologies, tools to coordinate their software development. This foundation upholds the concept that “every aspect of a business can be approached with design methods” and gives “designers permission and precedent to work beyond their typical boundaries”. Working Software over Documentation:This focuses on bringing out solution quickly so that it can be “accessed for market and viability”. Customer Collaboration over Contract Negotiation:Collaboration with teammates and customers builds consensus behind decisions which results in faster iterations and lessens heavy documentations. Responding to change over following a plan: “The assumption in Lean UX is that the initial product designs will be wrong, so the goal should be to find out what’s wrong with them as soon as possible” and this helps in finding the right direction quickly. Lean Startup uses a feedback loop called “build-measure-learn” to minimize project risk and gets teams building quickly and learning quickly. Typically startups are “free to build products in a manner which differentiate on quality”. Also startups can focus on “intrinsic value and usefulness of the product, rather than on a long list of mostly irrelevant features”. Startups have a distinguishable feature of reducing long product cycles into smaller, shorter chunks and validating these iterations with people that will use the products, actually opens the gate for important information needed to avoid expensive development cycles that come withsome kind of risk. ”The secret sauce of lean startup people is that they advocate for user experience research and design as one of the primary solutions to their business problems, and they do it using plain language”. The fundamental activity of a startup is to “turn ideas into products” at the first step. Next it has the aim to measure how customers respond and then to learn whether to pivot or persevere. So basically a startup’s success depends on this feedback loop. To be successful a startup has to accelerate that feedback loop. The feedback loop being employed here includes three primary activities: build the product, measure data and learn new ideas. However the Lean Startup method employed in Lean UX , is slightly different – it’s basically about “Think-Make-Check”. The difference lies in the fact that in latter case the “feedback loop incorporates your own thoughts as a designer, not just ideas learned through measurement”. Minimum viable product is a version of the product that enables a full turn of the Build-Measure-Learn loop with a minimum amount of effort and the least amount of development time. The MVP is, in fact, an early prototype that serves as a tool to learn and test the team’s assumptions. Lean UX is where prototyping is best promoted, focusing the prototype on major components of the experience. Once created, it will be immediately testable by any and all users to start the feedback loop. In most of the case the fidelity of the prototype is not a road block, rather the only mission is to get a quick prototype that can be tested quickly. However where the need for better visualization has priority, the best practices and tools are used to develop high fidelity prototypes in shortest time possible. There are some guiding principles behind Lean UX which can be used to make sure the methodologies used in a Lean process is on track. Cross-Functional Teams: Specialists from various disciplines come together to form a cross functional team to create the product. Such a team typically consists of Software engineering, product management, interaction design, visual design, content strategy, marketing, and quality assurance (QA). Small, Dedicated, Collocated: Keep your teams small—no more than 10 total core people as keeping small team has the benefit of small teams comes down to three words: communication,focus, and camaraderie. It is easier to manage smaller team as keeping track of status report , change management and learning. Progress = Outcomes, Not Output: The focus should be on business goals which are typically are the “outcomes”, rather than the output product/system or service. Problem-Focused Teams:“A problem-focused team is one that has been assigned a business problem to solve, as opposed to a set of features to implement”. Removing Waste: This is one of the key ingredients of Lean UX which is focused on “removal of anything that doesn’t lead to the ultimate goal” so that the team resource can be utilized properly. 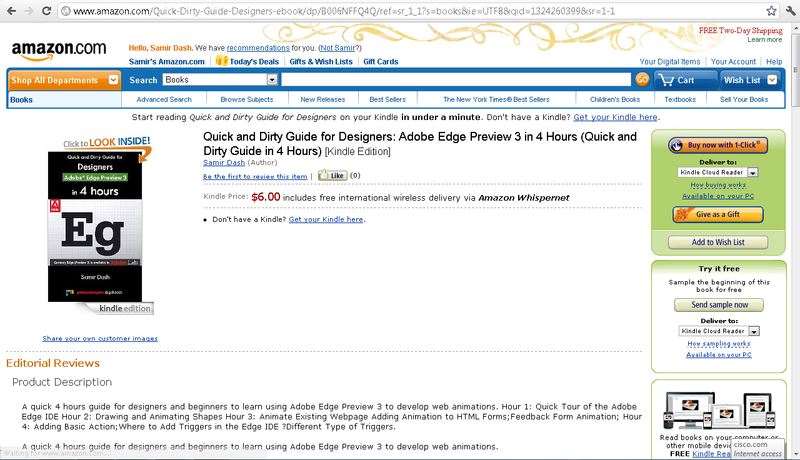 Small Batch Size: Lean UX focuses on “notion to keep inventory low and quality high”. 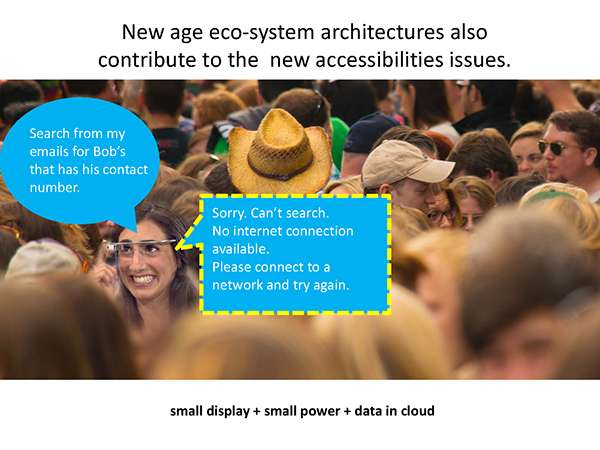 GOOB: The New User-Centricity: GOOB stands for “getting out of the building” — meeting-room debates about user needs won’t be settled conclusively within your office. Instead, the answers lie out in the marketplace, outside of your building. 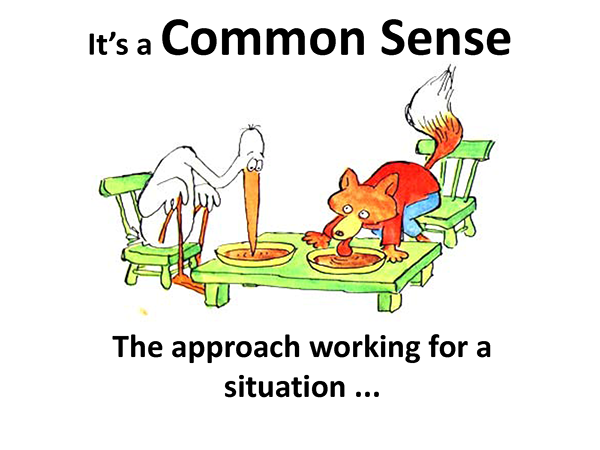 Shared Understanding: The more a team collectively understands what it’s doing and why, the less it has to depend on secondhand reports and detailed documents to continue its work. Anti-Pattern: Rock-stars, Gurus, and Ninjas:Team cohesion breaks down when you add individuals with large egos who are determined to stand out and be stars. So more efforts should on team collaboration. Externalizing Your Work:“Externalizing gets ideas out of teammates’ heads and on to the wall, allowing everyone to see where the team stands”. Making over Analysis: “There is more value in creating the first version of an idea than spending half a day debating its merits in a conference room”. Learning over Growth: “Lean UX favors a focus on learning first and scaling second”. Permission to Fail: “Lean UX teams need to experiment with ideas. Most of these ideas will fail.The team must be safe to fail if they are to be successful”. How UX Fits in Different Models of SDLC? In my last post “Challenges in UX integration with different SDLC models” we explored about the challenges of fitting UX into different SDLC models. I would like to extend that discussion in the current post. 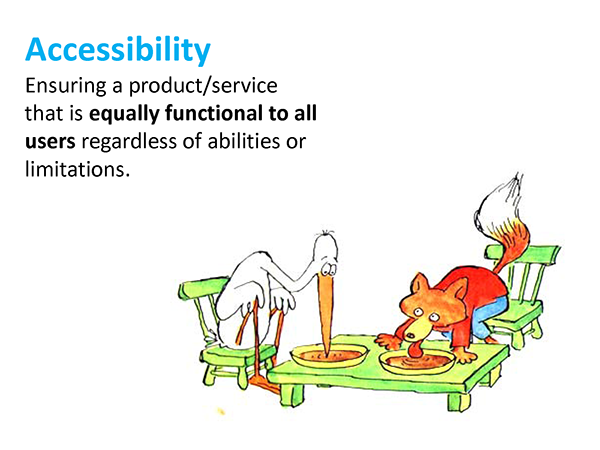 he pre-agile era saw many attempts of UX getting fitted into the waterfall and it’s derivative models of SDLCs. Such attempts by the many developers were natural outcome of the post-projects disasters, where ‘design’ was never the personality of “software product engineering” and the lack of usability doomed the products even after the initial set of requirements check list was fulfilled. 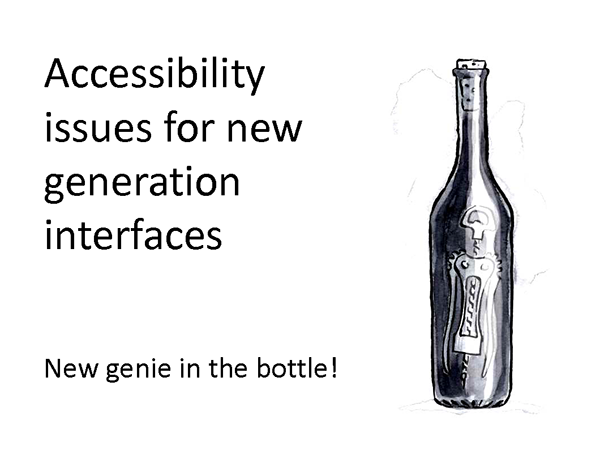 More demands for Graphic User Interfaces (GUI) in software application (due to GUI’s power to offer better visibility and power to the end users) tempted the developers to follow emerging UX practices which included a task to add “design phase” to existing SDLCs. Waterfall model was good enough to accommodate a notion of design in its phases and become popular despite its limitations (which later pave paths for Agile era). Most of the design approaches and techniques created during this era were having mostly a goal “to eliminate any deviation during the development process, by telling the developers exactly what we expect of them”. 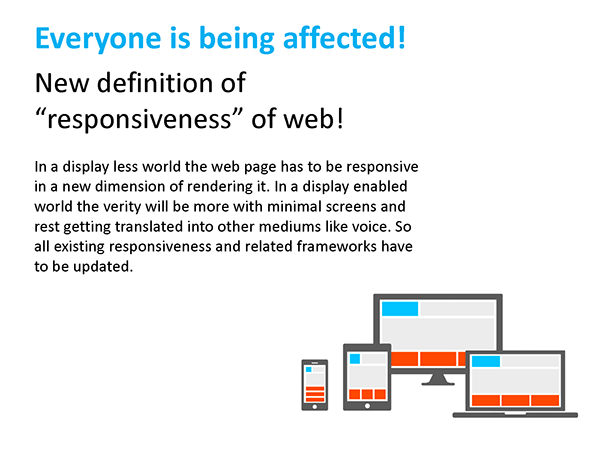 In this process the developers follow the different phases described in the previous section in order. In this model once one phase is finished, it proceeds to the next one. Reviews may occur before moving to the next phase which allows for the possibility of changes. Reviews may also be employed to ensure that the phase is indeed complete; the phase completion criteria are often referred to as a “gate” that the project must pass through to move to the next phase. Waterfall discourages revisiting and revising any prior phase once it’s complete. In this model deliberate iterative risk analysis, particularly suited to large-scale complex systems happens at a predefined frequency. It emphasizes risk analysis, and thereby requires customers to accept this analysis and act on it. So the developers typically spend more to fix the issues and are therefore often used for large-scale internal software development. Because of frequent risk analysis and more effort spent by the developer to analyze the risks accurately, the cost factor goes up in the project. In Spiral model, the UCD design can work across different quadrants of activities. The first quadrant where the objectives are determined, the usability and user research can happen as this is where requirements are planned. In the second quadrant the activities involving risk identification can best use UX activities involving IA and prototyping. The third quadrant of development and testing can utilize consultation and usability testing. The final fourth quadrant of activities can be used for feasibility evaluation and setting up usability metrics and bench marking for the next release. This method helps to develop a system through repeated cycles and in smaller chunks at a time, allowing software developers to take advantage of what was learned during development of earlier parts or versions of the system. 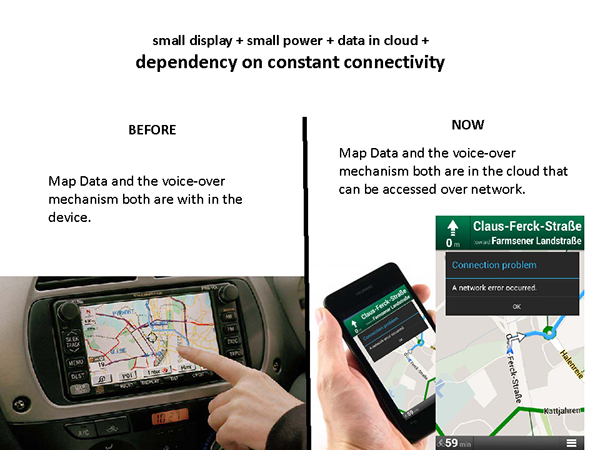 Incremental development divides the system functionality into increments (portions). In each increment, a portion of functionality is delivered through cross-discipline work, from the requirements to the deployment. The unified process groups increments/iterations into phases: inception, elaboration, construction, and transition. It identifies scope, functional and non-functional requirements and risks at a high level which can be estimated. Applying this model to multidisciplinary complex project with large volume can come with a risk as inability in the developers part to uncover important issues early before problems can spoil the project. In this model each iteration cycle can be divided into different activities phases to incorporate UCD methodologies for UX integration. Each iteration activities block that are mostly split across concept, design, build and test phases can be used for different UCD activities. This is perhaps today’s the most widely used SDLC model. It uses iterative development as a basis ,but uses people-centric viewpoint through user feedbacks rather than planning as the primary control mechanism. The feedback is driven by regular tests and releases of the evolving software. This is the most popular and successful SDLC model as of today as it allows better scope in providing continuous and iterative refinement to the product. There are several challenges in integrating UX design and related activities into a typical agile software development life cycle process. The most common problem is typically “ finding a balance between up-front interaction design and integrating interaction design with iterative coding with the aim of delivering working software instead of early design concepts”. This happens mostly because typical pure SDLC approaches primarily aim at “efficient coding tactics together with project management and team organization instead of usability engineering”.As Agile is more “a way of thinking about creating software products’ rather than being a specific process or methodology hints at the challenges of UX integration into it as integrating user research and UX design with agile, is itself an “agile antipattern”.The very idea of SDLC being a process for developing software , traditionally never kept the “user” into a focus, or event kept any scope for methedologies that try to bring any component that is not considered as native ingredient of the process of creating a software product. The focus was always the “cost, scope, and schedule” that drive any traditional SDLC models including Agile. And sure enough this typically gives rise to the challenges for UX integration into any SDLC as project managers never try to upset the balance of these three by reducing costs, tightening deadlines, and adding features in the specification. However even though there are many challenges in integrating UX design with agile practices, some researchers see “agile software development practices” as enablers for bringing UX design closer to software engineering and enhancing interaction between these two disciplines. In Current State of Agile User-Centered Design: A Survey. 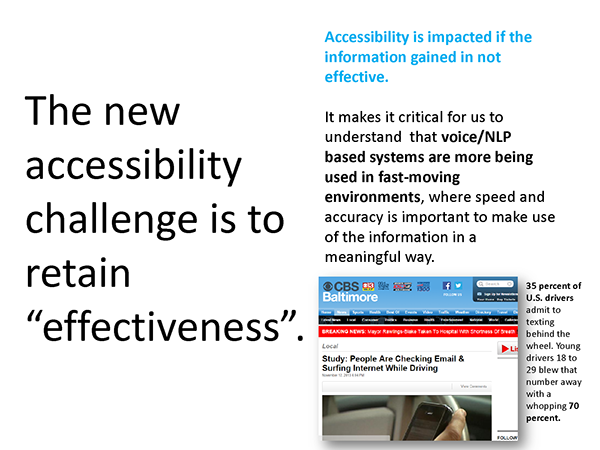 HCI and Usability for e-Inclusion. Lecture Notes in Computer Science, (by Hussain, Z., Slany, W., and Holzinger, 2009), a survey of the integration of usability and UCD practices with agile methods reported that “the majority of the respondents found that usability and user-centered design practices had brought added value through improvements in the usability and quality of the end product. Development teams often report that they are better able to respond to the needs of the customer with agile methods, and their measured or perceived productivity has been reported to be better than development teams using traditional methods”. Note that the above phases are not the phases we discussed regarding different SDLC processes. Rather these are the phases that can paired with different phases of SDLC processes depending on the SDLC model used. Typically Usability Designing Process is led by the “usability designer” with the team of field study specialists, user research specialists, usability evaluation specialists, prototype developers, interface designers and graphic designers along with other specialists from related disciplines that varies from project to project. How Usability Design Process Fits in Different Phases of SDLC? The different blocks of usability design process can be mapped to different process blocks of any SDLC model. The following diagram shows a generic model for typical process blocks for the typical iterative SDLC model. One thing to keep in mind is that process is not a complete product development process as it does not out put the final product at the end of the process cycle. 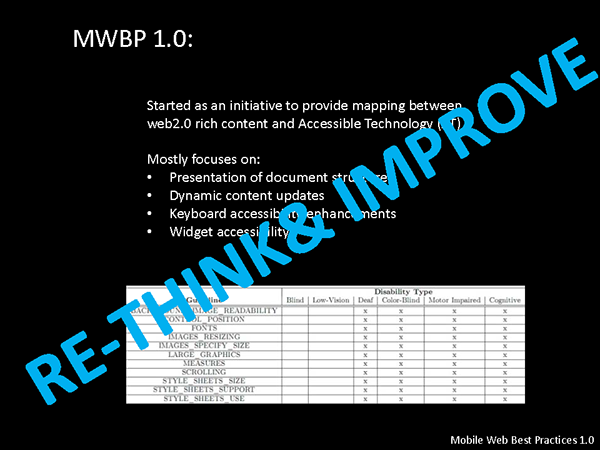 Rather Usability process supplements to any software development life cycle at various stages. Plan or Ideationand Requirement Analysis Phase: In this phase while the technical feasibility is being evaluated, UCD contributors can assist product management by conducting user research with people in the target market to evaluate target user goals, tasks, and workflow. Requirement analysis phase is also aided by the UCD experts in careful review of the gathered data and preparing metrics that can be used in the development phase. Design Phase: UCD contributors who are skilled at interaction design, visual design, and information design create mockups or prototypes of portions of the system, and contributors who are trained in usability evaluation assess the designs by subjecting them to usability testing. Build or Development Phase: UCD contributors are usually called upon in a consultative or interpretive role, meeting with the developers responsible for actual implementation of the product, and providing guidance for underspecified areas of the product. In this phase the UCD contributor’s role is to remain the consistent user advocate throughout the project. When negotiations must happen during design and development of a feature, the UCD contributor reminds the team of the design persona (the “design target”, or user group at which the feature is aimed), helps the product manager identify and weigh the risks of leaving off certain areas of functionality, etc. Integration and Testing/ Verification Phase:UCD experts help in benchmarking usability tests popularly known as “summative evaluations” that evaluates performance of the system /product developed on several grounds. The metrics of this test is typically based on the “error rate for users as they use the system”, the “time it takes to attain proficiency performing a task”, and the “time it takes to perform a task once proficiency has been attained”. CUPID (Common Unified Programs for Instruction Delivery) framework stands for a framework for a new way of instruction delivery for self-paced learning modules/courses. of such an approach, downloadable standalone digital learning materials win the case.So the fact is “self-paced learning” is a reality even in the age of social networking based MOOCs.” So one of the focus area of CUPID team is explore possibilities in the education sectors in developing countries, through exploration of new ways to improve the “self paced learning” domain. And this is one of many reasons why CUPID focuses on “self paced learning”. In addition to that the focus areas in finding new ways to provide richer “meaningful experience” is what differentiates CUPID from existing approaches through conventional CBTs/WBTs. We are not talking about replacing CBTs/WBTs with something new, rather improving the existing “self paced learning” approaches with new ways to improve user engagement and bring some reliability to it so that it can open new possibilities for certification courses to include “self paced learning” as a part of their certifications. So it’s all about the “new and meaningful experience” that we are planning to bring into “self paced learning” through CUPID. New ways to improve the self learning experience. courses provide though multiple choice or drag and drop quizzes. organisation has directed the employee to take the self paced learning to improve some skill sets. ). possible solution for self paced e-learning experience. To find new ways to improve the self learning experience. 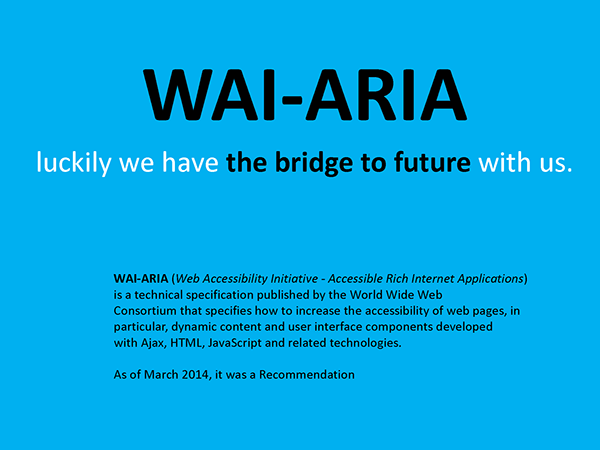 Add built in navigational components to support for physically challenged / disabled persons. Explore the possibility to get the user engaged with the course in the self paced learning in a way so that the training experience is not just a one way learning. 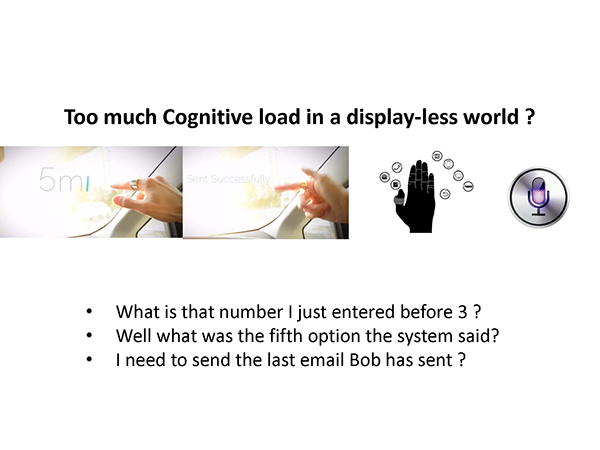 And of course we need to think beyond the basic interactivity that typical CBT/WBT courses provide though multiple choice or drag and drop quizzes. components of it. These focuses are defined in the section in the following. 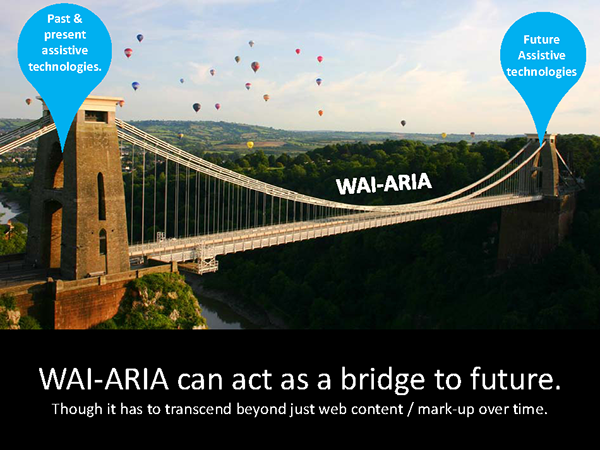 Focus #1.Improving usability of the content and the interaction delivered through it. 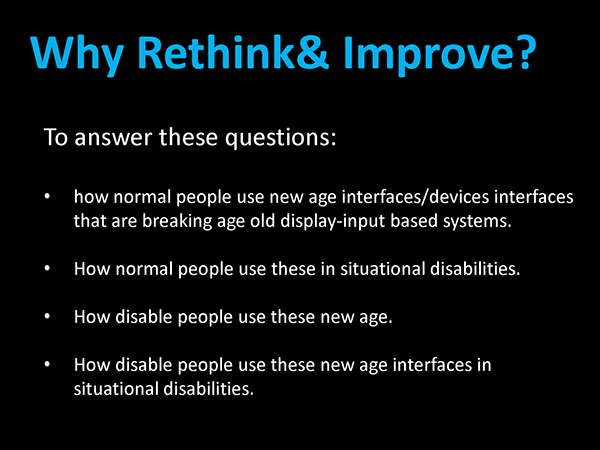 Focus #2.Add built in navigational components to support for physically challenged / disabled persons. Focus #3.Provide the user the ability to go through the course in both online and offline modes so that “any where any time learning” and be made possible to achieve. Focus #4.Provide DRM to the course content so that it can be used for Intellectual Property (IP) protection and can be useful in commercial e-learning channels and related business models. Focus #5.Provide features to make the two – way communication happen between the course and the user even in off-line mode. Focus #6.Add a reliable way to make sure that the user has actually gone through the course. Focus #7.Add a reliable simple certificate generator that will print the certificate to make the off line certification related course possible. Focus #8.Make sure the content is compatible with well know e-learning specifications like SCORM / AICC etc. Focus #9.Optional support for delivery of well known content package formats such as ePub, pdf, SCROM packages. Focus #10. Support custom Markup language/ XML with custom DTD for building of content. Focus #11.Provide components that can support the course content compatibility with Bloom’s taxonomy. Focus #12.Introduce new age assessment engine that will help the user self assess and review the level of skill he has obtained. Focus #13.Provide easy interaction between the course and the user for other features like bookmarking, highlighting, annotation, free hand annotations, text size and font type customization based on the user preferences. Focus #14. 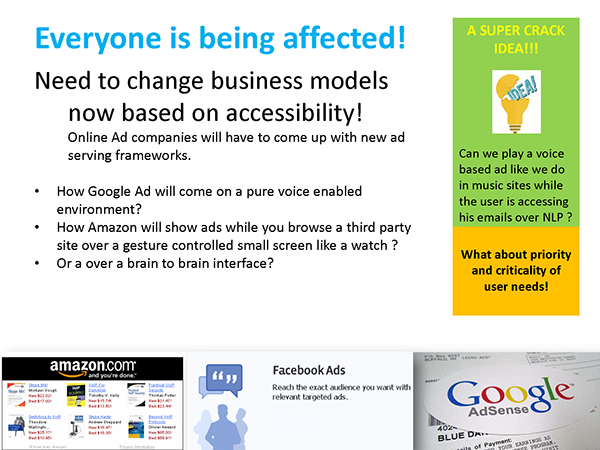 Component based framework so different components/sub-components can be plug and play mode or can be enabled/disabled. adding that to the framework. So basically the different plugins function in sync and provide the whole user experience and features. 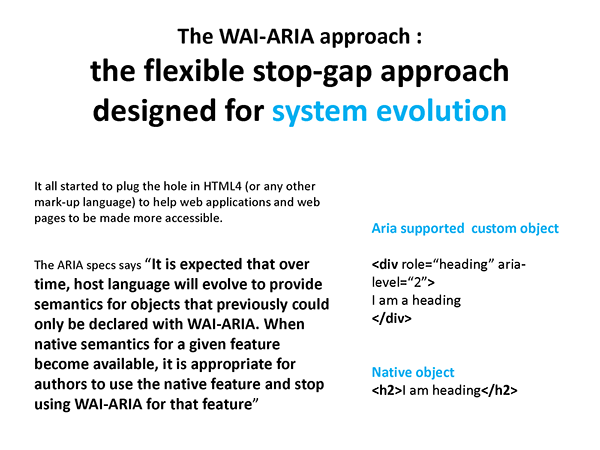 These details are discussed in the next section while detailing the innovative framework components. 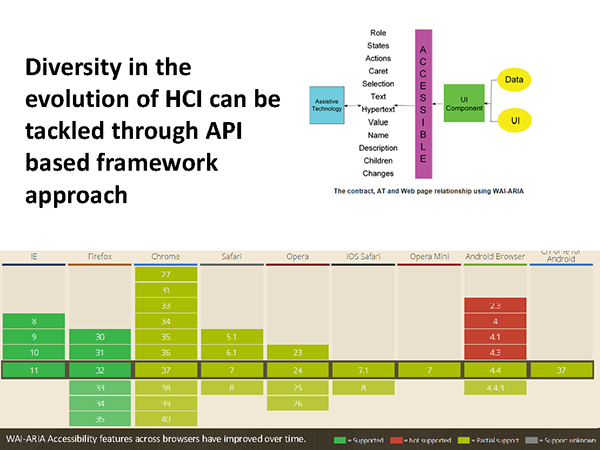 To fulfil this focus the concept learning framework has been designed in a component driven architecture. 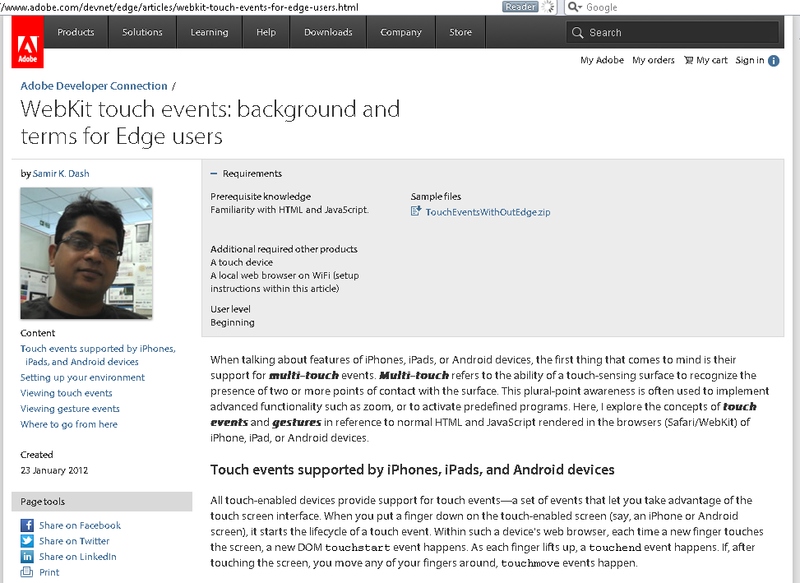 multi-touch support for touch enabled devices and mouse driven UI level approaches for PCs and desktops. 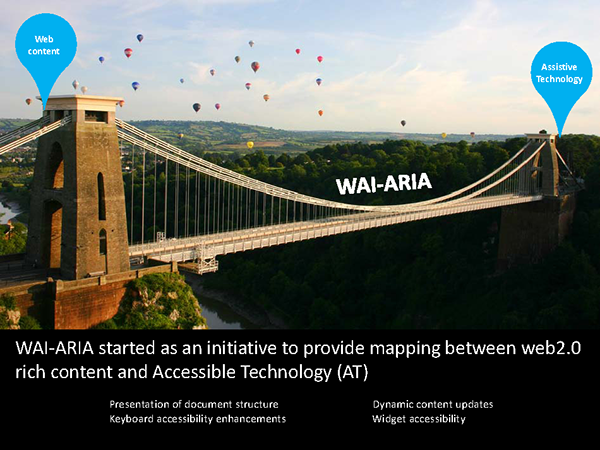 Contextual help: Contextual help will be available in each state/page and sections of different UI of the content displayed in CUPID which can be accessed through single gesture, mouse click or key hit. The contextual help will provide context specific information along with what is applicable in general including the hint on the navigational options available . This will help even the first-timers to find their position in the whole system. 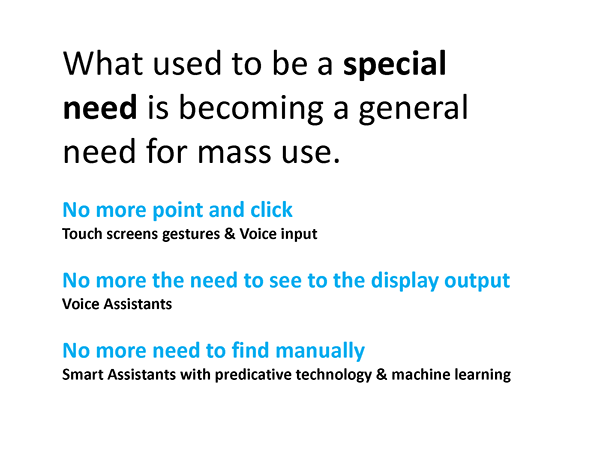 Built in navigational feature for visually challenged and persons having hard of hearing: Another most important aspect of the CUPID’s navigational system is the built in Offline Text to Speech Engine (OTTSE) along with Media Caption Manager (MCM). 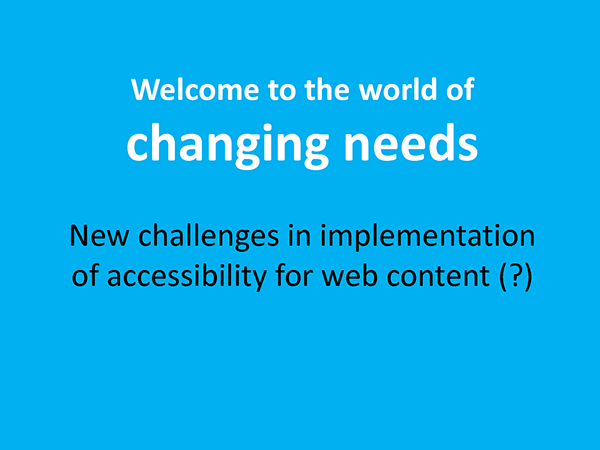 These help the disabled persons easily navigate through the content of the learning material. 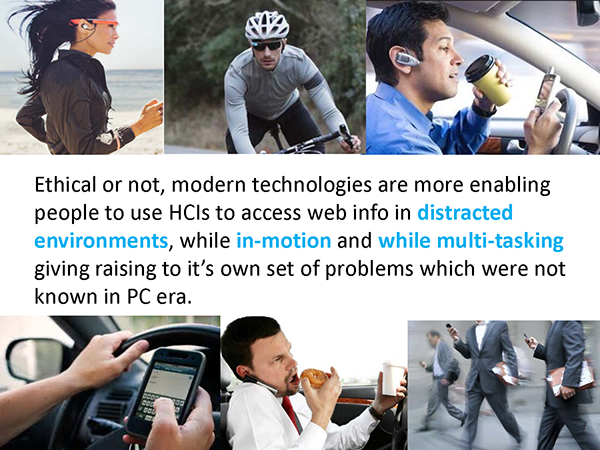 More information on this has been provided in the next focus point related solution in the following section. Built in Pseudo Inference Engine (PIE): This is another innovative approach through which the course interacts with the user to hep him set his learning path and based on which the navigation happens in the course. In simple words PIE acts as a guide for the user who helps in deciding which chapter of the course or content section to move next and which media to play in order to quickly meet the learning objectives and complete the learning path successfully . More details of this has been detailed in the coming section dedicated to the solution prescribed for Focus#5. This is in line with Focus #2 we have discussed These components will allow built in audio captions displays for media elements like video, audio, Podcast and Flash items. 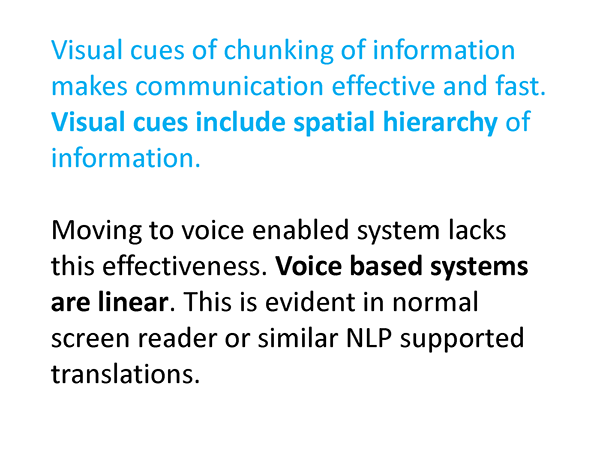 The Offline Text To Speech Engine (OTTSE) will be helpful for the person having visual disabilities. 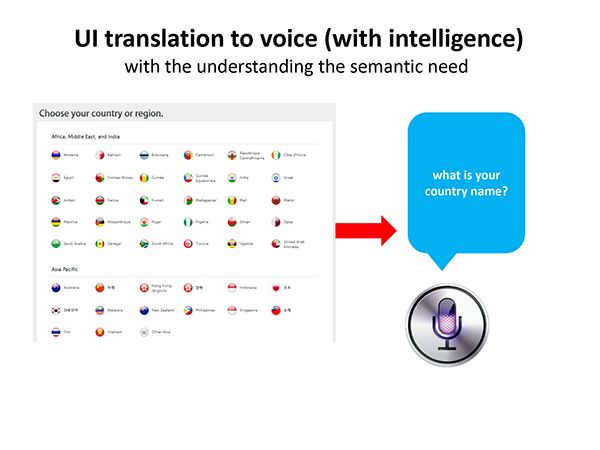 Whenever the learner tries to run the course on a system that does not have the screen readers installed or enabled, he can easily use this OTTSE feature to navigate through the course as well as can listen to the TTS generated voice-overs to the provided text materials. 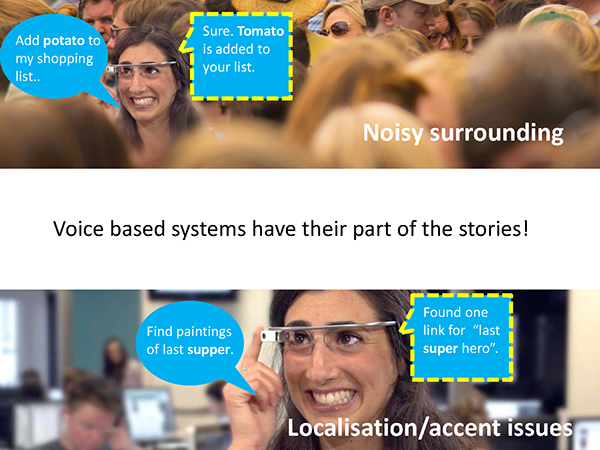 Offline real time text to speech generator for the navigational needs along with predefined audio clips. 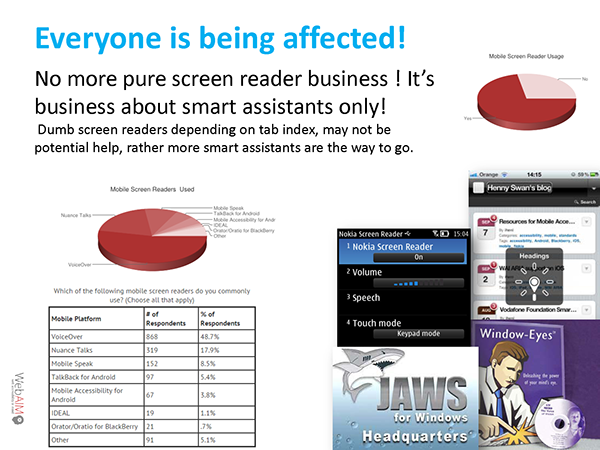 These will help in providing navigational hints to the end user on mouse clicks or tab key press, and multi touch gestures on tablets or mobile devices. Offline real time text to speech generator for course content having text . In case of any interactive media components like interactive Flash/HTML5 simulation, game or interactive, it will extract the text content from labels and process them for text audio generation. 1. Authoring side sub-component: This will allow content authors to add textual captions for their media elements. Plus it will have an optional component for auto generation of caption from interactive Flash files, video and audio components. 2. User facing sub-component and rendering engine: this will be part of different media players in the framework such as video , flash items, HTML5 interactive objects, audio & podcast players. The MCM will be helpful for the person having hearing disabilities. While they can watch the video , they can at the same time read the captions. Similarly, in case of the audio and podcasts , they can read the caption when they run those media components. This will help the content to sync the online store and catalogue of the courses and sync the titles available for the user as per their profile level access. Thecontent downloader component will download the offline content or course packages from the store and copy it to the local drive of the user’s machine. 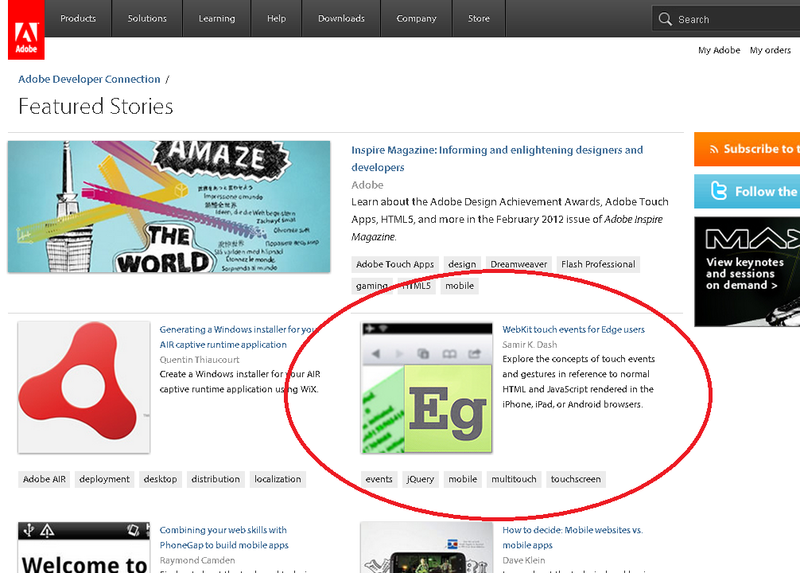 The reader sub-component will allow the content to render on the screen and provide the content level navigation. When the user becomes online, thecontent sync manager will check if any update is available and will sync the local storage/drive of the user with the user’s profile assigned online content store/catalogue. The first time content is accessed is used online; it will be automatically cached and will be used for future offline access. framework. The DRM Manager component will ensure the proper encryption and decryption of the content at the both server and client level. The component will also take care of prevention of unauthorized copying or printing of the content. It will also provide the content level control for limited printing and copying of the course content. At the point of downloading content: the user when downloads the CUPID course the course content are downloaded separately into it from the server in an AES encrypted form. That content is decrypted on demand when the user wants to run the course and wishes to go through any lesson. At the point of user interaction with the content: the user can not copy paste the content from the course , neither he can not print the content except for those lessons or sections that the content author has enabled for copying and printing. Along with this the user will not be able to view every options such as “view source” etc. 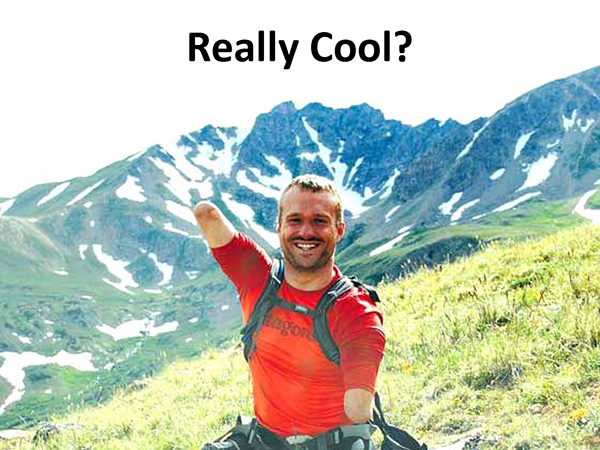 as the right click will be disabled. Course life time: Course content can be made to expire based on some time stamp and or number of uses. This is in line with Focus #5 we have discussed. The purpose of PIE component is to provide interaction based navigation, content searching and learning path decision making. This will be the component that will work on both offline and online mode. In the former mode, it will depend on a XML tree structured interaction map, to determine what kind of response it will give to the end-user to continue the two way interaction between the user and the course. In the UI PIE is represented as a simple terminal like BOT or a guide or an assistant to help the user. Also it is more like an wizard type component that can show textual information, links, can trigger other CUPID components and events and do the search the content and enable or disable course settings for the user depending on the interaction. PIE is actually one of the most innovative and unique component that is shipped with CUPID through which the course interacts with the user to help him set his learning path and based on which the navigation happens in the course. In simple words PIE acts as a guide for the user who helps in deciding which chapter of the course or content section to move next and which media to play in order to quickly meet the learning objectives and complete the learning path successfully. CUPID PIE (Asks questions and infers)  : Hi How can I help you? User (Gives Answers and gets help and info):Not sure which lesson to start with. CUPID PIE (Asks questions and infers) : Ok. Are you looking for a quick solution for any particular problem or are you looking for understanding the whole concept and get a certificate? User (Gives Answers and gets help and info):Really? User (Gives Answers and gets help and info): Hmm..ok. I want to know how to create a cake for my cooking class.Searching…please wait. CUPID PIE (Asks questions and infers) : Searching for Vanilla related recipe …it seems there is some some video you might be interested. Video1: How to add Vanilla to your cakes? .. Video2: Without vanilla make pies…Video3: Indian Vanilla flavors. Seems like video 2 is more similar . User (Gives Answers and gets help and info): Hmm..right thank you. Please play this. to understand what can be most probable need of the user and based on that can determine the sequence of results/options it shows to him . 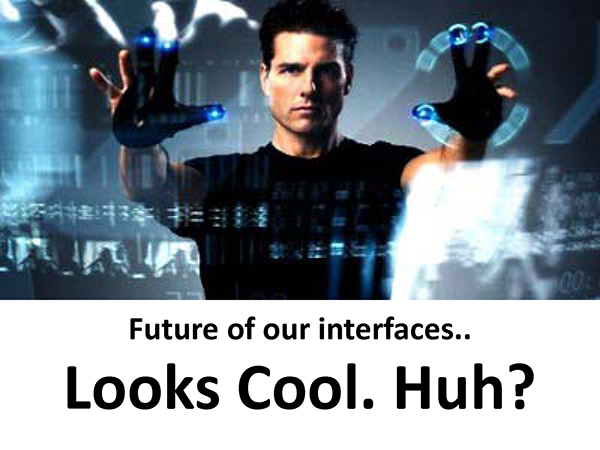 The interaction maps can be developed uing CUPID authoring modules. all these different scenarios. In such cases LPS actually helps in finding out what learning path is best fit for the user. for the target content in any course. contents are to be presented to him. watches the videos , textual or any interactive content. modules can be trusted for providing trainings. assessment and generate the certificate. course in progress till the user returns to his seat and take some action to resume the course. learning course. More details of this aspect is discussed in the next section. This is in line with Focus #7 we have discussed. This component will have 2 subcomponents. enable the learner to take the self assessment for generating a certificate from the learning framework for a target score. sure that the user has actually gone through the course and has himself attended the assessment. certificates from the offline /online course. This component uses well known encryption alogorithms like SHA, Blowfish etc. use as a reliable certificate of his learning status. learning status from the target learning framework. Make SCORM / AICC packages compatible with CUPID to run them as a standalone offline course in offline. component with the framework so that other non-SCORM features of CUPID are also available in the same course. of time those data can be exported to other standard LMS which are compatible with SCORM / AICC. will use this language to develop the courses. The CupidML markup language tags are simple meaning ful for content authors. captioning etc. and “1” represents the URL index number in the podcast array defined in the data file / configuration file. A typical page in .cml will be much simple than the actual code that is generated in the runtime by CUPID to make things happen and provide qall the interaction and event propagations and API calls. This is in line with Focus #11 we have discussed. There will be built in components that can support the course content compatibility with Bloom’s taxonomy. For example there will be default learning path creation components which will allow content authors to add “surprise” elements, in-between questions and “case studies” and scenario based task. The content authors can select predefined “Instructional Design” templates and then can fill up the place holders to quickly create the courses which will be compatible with Bloom’s taxonomy. Different Instructional models fulfilling “creation”,” discovery”, “analysis”, “remembering”, “understanding” and “applying” phases in various degrees. Scenario based training: where different scenarios are combined together with the assessment, guided tasks to the user, so that the user can actually. 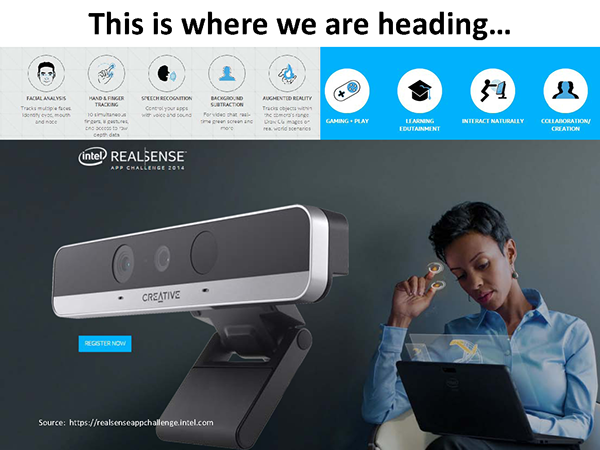 Case studies : In this model the sample case is presented through real life scenes, and based on that case, related video, audio, interactive, media along with assessments can be grouped together. 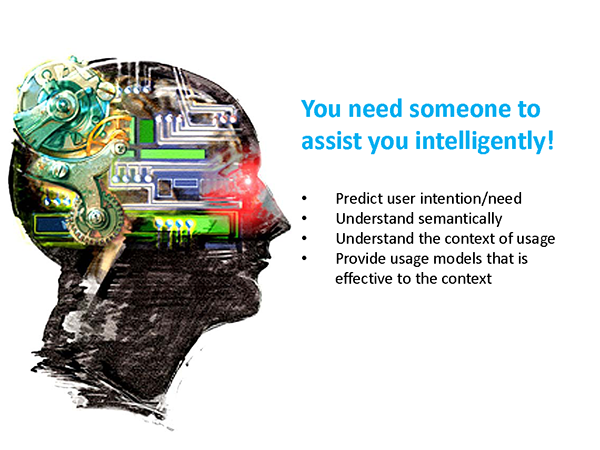 Guided Tasks: In a guided task, the major focus is on providing the user a task to complete where the user assisted by some character/bot /or simple alert based instructions. Whenever the user makes any mistakes the system alerts the user and provides hints on how to solve or proceed with the task. Now combining these sub-types, most of the course can be built to fit the need of any type of self learning modules including soft skills training, software simulation trainings to educational course materials. Textual Study Mode: In this mode the content types like text, hyperlinks, internal anchors, popup tool tips, quiz, assessments etc. will be available for the target course. Interactive Media Mode: In this mode the content types like video, audio, podcasts, animations, interactive , game, simulation, guided task etc. will be available for the target course. needs to use for his learning at any point of the time. (4) The “in-between” hit and click type question with special scoring. The Guided Task is a kind of assessment, where the user can self assess if needed in a BOT/Wizard assisted simulated environment. This kind gives the hands on kind of experience when combined with simulation. Basically there will be a wizard or guide or assistant who will first assign a task to the learner based on the things he has learned and then help him on the way to complete his task by providing hints and task related tips to the users. The Interactive Scenario based question sets are provided as a part of any lesson / logical learning chunk where the user is provided with a case scenario through a interactive/video/animation/slides. Then the user is asked to view some screen-cast or interactive simulated environments and then is provided with some interactive questions. The Basic simulators for software related trainings are the sets where the user faces some software training related UI screens / simulated environment to hit and click different UI elements and provide input to complete the tasks. This will help the user in giving a first hand kind of feel of the target software on which he is getting his training. This is in line with Focus #13 where the user needs to make bookmark any point of the course (a page or a tab), make some content selection and highlighting it in addition to adding a note or annotations. Plus free hand whiteboard type annotation of the course and customization of font size, font type and theme are taken care of by this component. User is provided with standard UI with controls in the lesson area so that the user can avail any these functionalities with in single clicks. This is in line with Focus #14 we have discussed. This is related to the technical aspect of the framework. The whole framework is a combination of multiple “Plug n’ Play” capable components. This component is responsible of allowing integration of new components with the core framework engine. This is also responsible for opening APIs that can be used by the developers to create and add new Plug an Play components for the framework. The diagram above, clearly details the process flow and how the core APIs are related to the different plugin or extension components. Any code chunk or package that is compiled as a component or plugin of the CUPID framework is consumed by PnPRE and then it process that code of the component to add that to the core CUPID framework in real time to provide the new plugin related functionalities /feature. This makes easy for any developer to extend the CUPID framework and / or customise it. 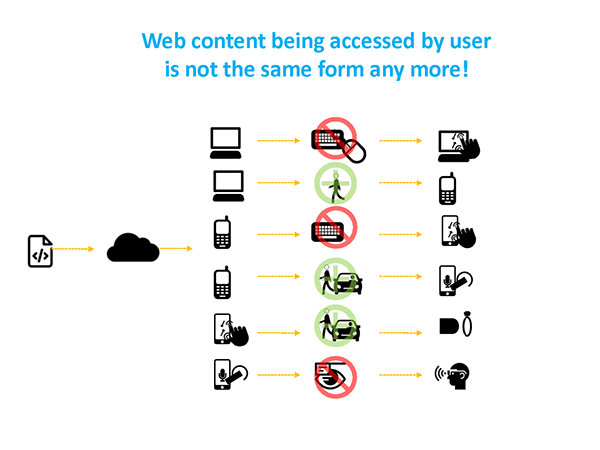 The CUPID framework basically targets all the standard digital devices from personal computers, desktops to net-books, small screen mobile devices and stand multi-touch tablets and the related hybrids. 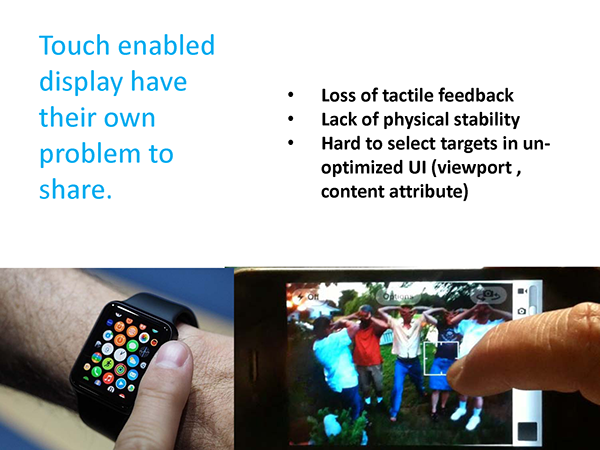 That is the reason, the usability focus is always on device specific and based on the context and environment the user is interacting. Determine the host environment through browser and OS sniffing.Also sniffing made for available real eastet on the screen and resolution, color depth etc. to provide suitable UI layout. Also sniff for available hardwares like camera, speaker, mic etc. 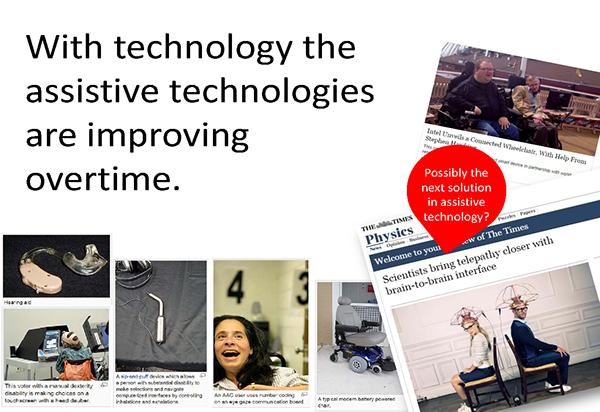 in the device so that the usability aspect can be determined. Sniff for input devices like multi-touch screen or mouse or keyboards, so that the user interaction types can be determined. 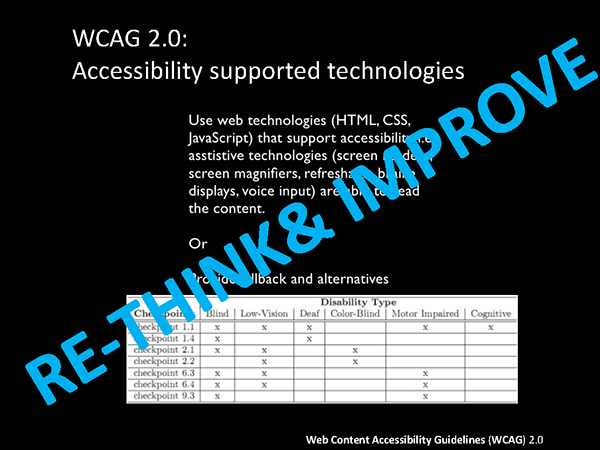 Determine if the user/learner needs special assistance due to any visual or hearing disabilities. 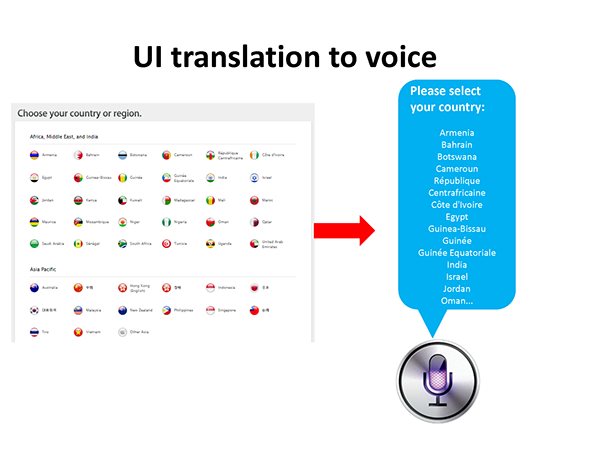 This will help in deciding if the built in offline voice-over features enabled or the captioning system to be enabled. customisation thresholds are determined and the best possible experience is delivered to the learner. The technology stack used in CUPID are based mostly on open technologies so that the framework can be easily maintained using open source (MIT licensed only) code , plugins. will be easy and economical to get the support on open technologies related online communities/ forums. get more contributors from the community. XML, XSLT – data and style rendering. 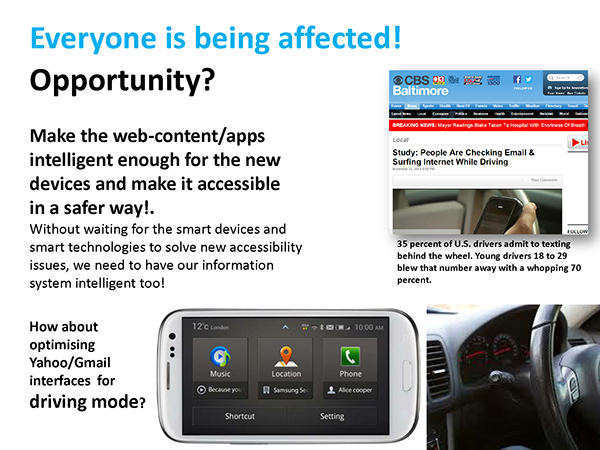 Platform /native specific: Objective C, Android, C, C++, Phonegap SDK, Sencha SDKs etc. The project should sustain in the currently competing commercial and open source worlds.The framework should available FREE of cost to the content authors from the under privileged or having financial challenges. It should be available as an open source initiative while at the same time it should allow scope of the framework to be used commercially. Any commercial firm can use the framework for custom development to develop or enhance it for commercial purpose by paying some licensing fees. The project will be MIT licensed so that the commercial versions are not bound to open source any modifications made on the framework unlike the GPL one. 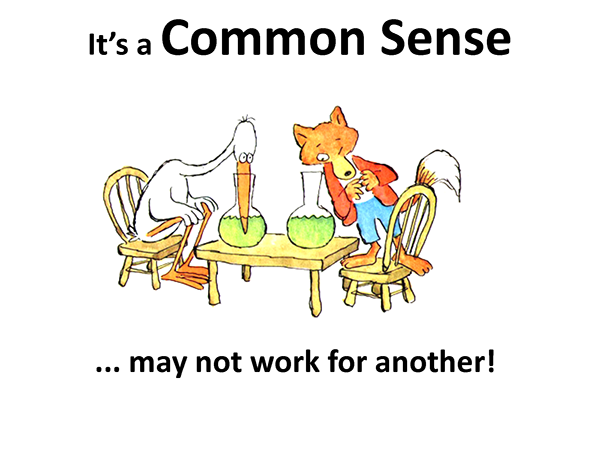 Any company/organisation can pay a license fee based on the volume of usage their commercial version will have, in order to develop/extend it for a commercial version.The content authors/teachers/developers/organisations/NGOs doing social service on education and would like to extend and use the framework non-commercially are free to do so without paying any fees. And their extensions will not be open sources if they wish. For getting support on technical or behavioral aspect of CUPID, there will be an annual support fee to be paid, which needs to be renewed each year till the time the support is needed. CUPID is the framework that actually attempts to rediscover in the “self-learning” domain of e-learning , which we think we have already discovered! CUPID, implements some fresh concepts and unique ways to improve the learning experience for the user and at the same time makes it easy for the content authors to quickly develop and deliver highly interactive and rich content without the content author to be worried about the technicalities. 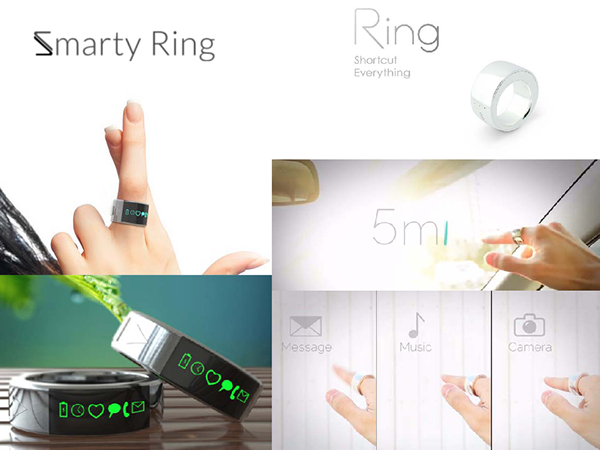 CUPID also address the needs of the continuously changing world which is on a fast track pace in moving through the digital revolutions e.g from PC to laptops to mobiles and tablets. It provides unique way to create once and deploy in many platform. Also CUPID goes beyond the standard limits of the Instructional Designs and provide new blends that can provide fresh way to keep user engaged with the course. CUPID also mends the gaps between the MOOC based elearning trend and the “self paced ones” by adding ground breaking “course-user interactions” through the assistants, BOTS and the PIE component, so that always the user will feel like the being assisted and guided through his learning curve. CUPID helps the user in finding the correct learning path to make his learning curve more effective and short. 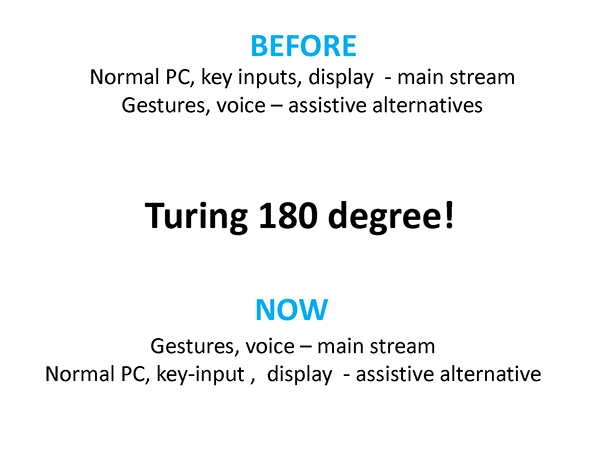 Last but not te least, CUPID has built in features that supports visually challenged and persons with the challenges in hard of hearing by providing feature that work even in a case of screen reader is not present. 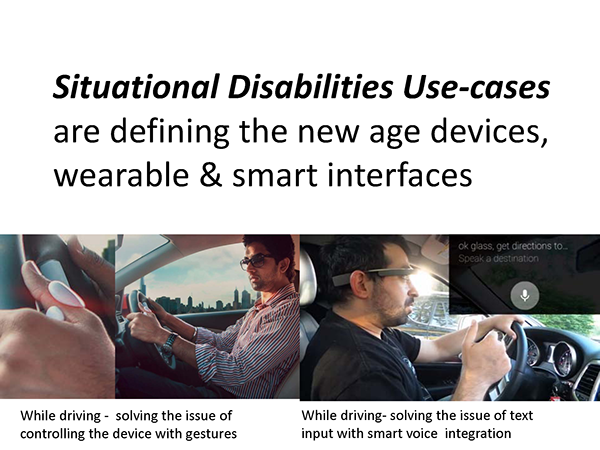 Also it provides unique way of voice assisting navigation plus caption based (interactive text labels ) navigation and content media guidance for people with hard of hearing. 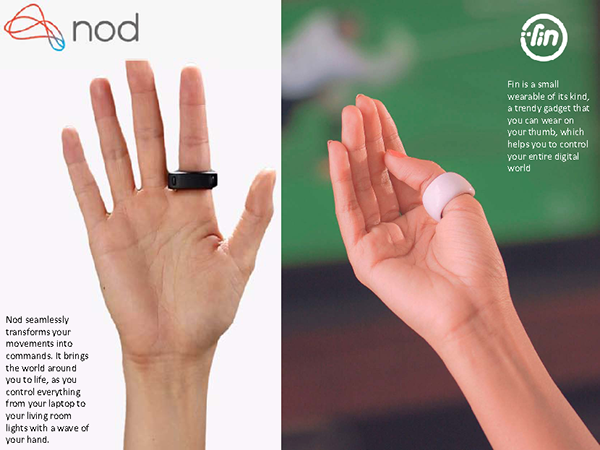 In a single line CUPID is all about re-innovating the “self-learning modules” for the next decade. The approach of CUPID follows a vision that focuses on every aspect that a learning environment depends on. User, his taste, his learning requirements and assists him in all though the way of his learning curve for the self learning period on the topic from the target module. Certification needs: so that the user can go through self –learning and at the same time generate the certificate which is reliable and meaningful for authorities/organisation requiring certificates from the learner (an employee). Commercial aspect/developers: provides options for extending the learning framework for a successful commercial product as well as for content producer companies who can reliably protect their premium content on the self learning modules through DRM feature implemented. Financially backward sections in the world: CUPID is FREE for financially backward sections/organisations/authors to develop and extend it for their use non-commercially. Free Institutions: All NGOs, educational institutions, universities, non-profit institutions are free to extend it and allowed for keeping their extensions non-open sourced if they want . So that they can use it in exam needs etc. as long as they are not using it for commercial purpose, they can enjoy this freedom. 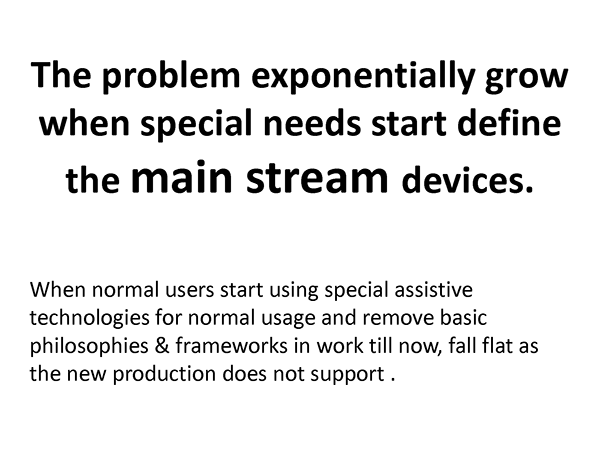 Physically challenged: Visually challenged and persons with hard of hearing can use CUPID without any extra screen reader or hardware/ software installed in their system.